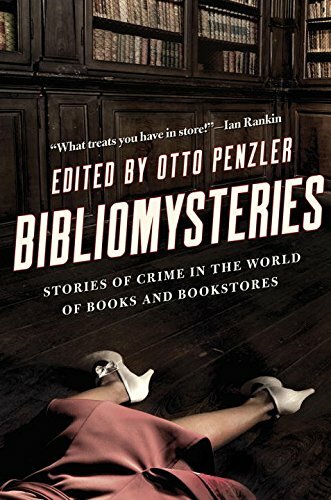 An anthology featuring short stories by the best of the best writers of mystery and suspense, including winners of the Edgar Award, Bibliomysteries edited by Otto Penzler deserves a place on every fan’s bookshelf. Although the short stories all feature a book or books as a major theme of the plot, each author brings a unique perspective to what constitutes a crime. From “Pronghorns of the Third Reich” by C. J. Box, in which retribution is demanded by the loser of a lawsuit, to “Rides a Stranger” by David Bell, in which an out-of-print book provides a motive for murder, Bibliomysteries is a cornucopia of murder and the kind of mayhem engendered by lesser crimes. Three of the stories center around the Second World War, each one very different. “The Final Testament” by Peter Blauner finds Dr. Signumd Freud confronting Anton Sauerwald, a member of the Nazi Party whom claims he is responsible for Freud’s escape from Austria, and demands a favor in return. Another noir story is “The Book of Virtue” by Ken Bruen, which features some of the usual suspects: the manager of a bar who has inherited an unlikely book from his abusive father; the owner of the bar, a killer who is associated with the Russian mafia; and gorgeous Cici, who has a plan on how to get rich quick. “Book Club” by Loren D. Estleman, satisfies the fan of the more traditional whodunit as Chief Dockerty, the police chief of a small New Mexico town, seeks the murderer of a local book collector. His unofficial partner is an elderly former homicide detective turned rare book dealer, Avery Sharecross. Chief Dockerty and Sharecross, both endearing characters, cry out for their own series. Greed and a not unexpected double cross are motives for murder and betrayal in “Death Leaves a Bookmark” by William Link. The appearance of Colombo, he of the wrinkled raincoat who seems never able to find his notebook, makes this a nostalgic story for those who still love the old TV series. Anne Perry injects a touch of the supernatural in “The Scroll.” An ancient manuscript is found as part of an estate sale. Monty Danforth, assistant at a Cambridge antiquarian bookshop, tries to photocopy the ancient manuscript, but discovers it cannot be copied by any means. This makes him uneasy, but not as uneasy as the men who appear demanding to buy the manuscript, all warning him that it possesses enormous power. Bitterness toward an old classmate, desire for retribution for past deceptions, memories of an old love, and a misinterpreted text message lead to a documentary film maker taking a fatal tumble down a staircase at the London Library. Of course, he had a little help, but one might say he reaped what he sowed. The real star of “The Long Sonata of the Dead by Andrew Taylor is the London Library. This wonderful old English institution lends almost a legitimacy to the murder of a man who is at best unlikeable, and at worst careless of other people’s property. “The Book Thing” by Laura Lippman begins by asking who is shoplifting books from a children’s bookstore, but ends with a profound observation on nature of books. “I’m letting them live. They were dying, inside their covers, on shelves. No one was looking at them. Now they’re open forever, always ready to be read. Another sort of traditional whodunit, or perhaps police procedural is the better term, is “The Book Case” by Nelson DeMille. Detective John Corey investigates the death of Otis Parker, bookseller and husband to the lovely, much younger Mia. Is it an accident or is it murder? How did the heavy bookcase happen to tip over and squash poor Otis? With a little broad humor and a shrewd mind Detective Corey unravels a web of greed and betrayal. The jewel of the anthology is “The Caxton Library & Book Depository” by John Connolly. Winner of the Edgar Award for Best Short Story, Connolly’s tale of a mysterious library is whimsical and subtly humorous, two qualities of his writing that never get the credit deserved. The story reminds one that fictional characters can become more real than one’s next door neighbor. If characters become real, where do they live? Mr. Berger learns the answers when he follows Anna Karenina after he prevents her from throwing herself under a train. A wonderful, wonderful story—as are all the tales.